For this landmark record of music by Carl Philipp Emanuel Bach (1714-1788), pianist Alexei Lubimov has assembled a rich conspectus. More than that, he has delved into the history of the classical keyboard and its precursors, coming up for glorious air with the rarely heard tangent piano as his tool of choice. As one of a handful of options available at the younger Bach’s fingertips, it comes alive in this unusual combination of scores and performances. The title of the program, Tangere, means “to touch,” and embodies Lubimov’s ideal as interpreter, if not also Bach’s as composer. As noted by New York Times critic Cleveland Johnson, the tangent piano recalls the Middle Eastern santur, and indeed operates by a kindred principle of hammer and string. Like András Schiff’s ECM New Series recording of Franz Schubert on a Viennese fortepiano, its rewards far outweigh the time it may take to accustom oneself to its timbre. Between 1779 and 1787, C.P.E. Bach produced six collections of fantasies, sonatas, and rondos “für Kenner und Liebhaber” (for connoisseurs and dilettantes), and it is from all but the second and fourth of these that Lubimov has plucked the juiciest fruits. The Freye Fantasie (Wq 67) that opens the program is also its longest, taking listeners through 11 minutes of time travel. In addition to its mature composing and foreshadowing of the even greater piano literature waiting in the coming century, it showcases the instrument’s gamut of colors, moods, and textures. The same characterization holds true for the Sonate II (Wq 57) that follows, sandwiching between its charming outer layers an inner oasis. Selections from the Clavierstücke verschiedener Art (Keyboard pieces of various kinds) of 1765 and Musikalisches Vielerley (Musical miscellaney) of 1770 flesh out the middle ground with shorter bursts of creative exposition. Among these pieces are the delightful solfeggi, which pack the punch of extra-strength medicine capsules. In this context, the Sonate VI (Wq55) comes across as downright cinematic for its use of space, movement, and framing. Its central Andante is so hauntingly suited to the tangent piano that it feels born from within its strings. All of which renders the concluding Fantasie II (Wq 59/6) a vessel for any virtuosity that preceded it. Renowned conductor and pianist Hans von Bülow (1830-1894) famously said: “Bach is the Old Testament and Beethoven the New Testament of music.” But this analogy only feels true in chronological terms. In any other aspect, the reverse would be more accurate, for while in Beethoven we encounter the judgments of a vengeful God, in Bach we feel the salvation of grace. Indeed, ECM’s New Series had been enamored with Bach for years before dipping into the canon of Beethoven, and Hungarian pianist András Schiff (previously known for his spirited renderings of Schubert, Mozart, and Bach himself) did that and more, gifting us with revelatory performances of the entire Beethoven piano sonata cycle. Totaling 32 in number, these sonatas remain the heart of the iconic composer’s oeuvre, each its own ecosystem of influence. To that end, Schiff boldly decided to perform each sonata in at least 15 cities before sitting down for these live recordings at Zürich’s Tonhalle, the acoustics of which seem spun directly from the piano itself. Schiff believed the immediacy of live performance was vital in bringing Beethoven to life on CD. The only exception is the final disc, recorded in the empty hall of the Reitstadel in Neumarkt, Germany. Schiff also used three pianos: a Steinway for the more dynamic pieces and two different Bösendorfers for the lyrical. In terms of sound mixing, the left hand dominates the left channel and vice versa, thereby creating a virtual piano in the ears. Kernels of what would later be construed as Beethoven’s genius are easily gleaned from these groundbreaking first offerings. Consequently, Schiff waited for decades to ease into this material, a decision that rewards our listening most profitably. Schiff is adamant about following the interpretive clues Beethoven has left behind in his scores, taking to heart—even as he sets aside—the elisions and additions of his predecessors. He greets each sonata as a new friend, idiosyncrasies and all. Although these sonatas are hot on the heels of Mozart, in Schiff’s estimation Beethoven is prose to Mozart’s poetry. If Beethoven is synonymous with drama, then let this be the curtain-raiser to Schiff’s epic endeavor. Shades of Haydn (to whom all of op. 2 is dedicated) abound, but arrive at a series of distinct solutions, both open-ended and alternatively solved. Schiff manages to draw out a dramatic exploration of themes with limited means. Dynamic control in the Menuetto is strikingly effective here, while the Prestissimo is a thrilling conclusion to this earliest sonata and already speaks of a turgid energy dying for a way out. The final bars are filled with a lush restraint that erupts into the ultimate downward trill. A more playful, even humorous mood dominates the op. 2/2. A sense of freedom within bounds, like a child who is limited only by imagination in terms of what can be seen and experienced under constant supervision. This sonata is a grand experiment in movement. It runs, trips, falls, and picks itself up again in its repeated attempts to regain locomotive control. This seems to be one of the most difficult of the 32 sonatas to play, if only because of the demand for sustained focus and emotive energy that plows its whimsical soil. The Allegro is a grandiose series of textures all describing the same playroom and recasts us as parents watching over the children we once were. On the one hand we are joyful toward the innocent display; on the other we mourn the loss of our interest in trivial things. This isn’t the philosophical Beethoven, but no less a contemplative one unafraid to work through his own indecision in the open forum of our scrutiny. The Scherzo sparkles here with jewel-like brilliance before tossing us like a discarded doll into a satisfying conclusion. A verdant and dramatic Allegro starts things off with the slightest hint of Händel to keep our ears in check. Superbly controlled runs and arpeggios make this a joyful listening experience overall. The musical equivalent of a period of rest that precedes the return leg of a long journey: we relive the joys of our destination while yearning for those of home. This sonata offers such a wide variety of colors that one wonders where the young Beethoven found the time to pluck them from the proverbial tree. Of the early works, this more than any other showcases Beethoven’s unique “posturing” as one looking back over a much longer life. Already he displays a grand affinity for, and subtle reinvention of, the sonata form. We end on a curiously somber note, collapsing to the ground after a futile attempt at escape. Schiff’s second installment is full of surprises and reflects the superior dedication of its execution. The op. 10/1 sonata feels like running. Like all of the early sonatas, it’s always moving. Whether slowly, briskly, or at a horse’s gallop, one feels it going somewhere, even if the destination isn’t always clear (not least of all to Beethoven himself). This leaves the performer to determine said destination and to commit to a path leading there. The op. 10/1 further reveals formative intimations of Beethoven’s “concertistic” leanings. Rather than exhibiting the embryonic characteristics of a composer in his mid-twenties, the forms herein act like fully realized beings who think deeply before speaking. The opening Allegro establishes a one-to-one correlation between form and melodic drive. Schiff’s playing veritably jumps off the page like a script dying to be orated before an enraptured audience. Arpeggios sing with grace and dutiful restraint as the right hand dominates with subtler pleasures. A contemplative Allegretto leads into a swinging Presto with all the verve of one who believes passionately in the value of darkness. Not that this is a morbid piece; only that its nooks and crannies are deep enough to inscribe loaded variations into an otherwise dainty surface. A standout in the entire cycle. What Schiff does with it is miraculous. A bit statelier in feel, this sonata nevertheless rushes forth with its own power. Among the quieter sonatas, it embodies a chamber-like sensibility. And even though it may not hit you over the head with its style, it packs a delayed punch, seeping undetected under the skin, lacing our systems with subdued petulance. Though often seen as one of Beethoven’s more “symphonic” sonatas, here the op. 13 if anything feels “sympathetic.” The opening movement fights its way to a centered mode of understanding in its attempts to overshadow internal pain. It is consolatory, patient, even kind. Its many spontaneous shifts are never instigated without careful reassessment of their own devices. The recapitulating motif is comforting, mellifluous in its persistence. The Adagio binds us. In doing so, it avoids falling into a trap of oversentimentality, unfolding instead with the uneasy grace of human (read: mediated) emotion. The concluding Rondo and Allegro twirl with the measured rhythm of a dancer who must leave her shoes in a dusty, shadowed corner at the end of the day, but who refuses to leave the studio without first giving her all in defiance of the wall-length mirror that stands before her. “Already in his early sonatas,” Schiff tells us, “Beethoven is a psychologist, not only as regards the organization of the movements according to their inner logic, but also in the unity between the various movements.” Thus does the trenchant pianist bring an analytical edge to his third installment in the Beethoven cycle. Its offerings are rougher around the edges, even as they continue to be microscopic in precision. This sonata sets the tone for a disc that is markedly miniaturistic. The gestures are quick and painless, never lingering too long on the tongue before subsequent flavors take over. There’s an overt delicacy to this sonata that is strangely invirogating in light of the last volume’s “Pathétique.” In contrast to the energetic infusions required on Schiff’s part to bring it to life, the Op. 49 presents a more relaxed Beethoven, rocking us gently through the final menuetto into the op. 14/1. While this sonata and its present company are relatively easy to play, they’re not without their difficulties (though one would be hard pressed to distinguish them from the melismatic uniformity of Schiff’s effortless stylings). While this might not be one of the most memorable of sonatas overall, its lively Rondo is a highlight among them. For all its brevity, this one is charmingly captivating. The opening Allegro ripples like a fluid stream caressing rocks rounded by centuries of erosion. The Andante plods along with an almost pompous assuredness, swaying its head from side to side as it prowls the streets for attention. The closing Scherzo is deceptively constructed, cloaking itself in the mood of a sporadic chase, a cat in search of the elusive thematic mouse until…not a pounce but a strange remorse over the killing of one’s object of entertainment. This might very well be Beethoven’s “breakout” sonata, as it marks his return to the four-movement structure he made his own. With a sort of fractured bravado, it circles an axis of motifs like a bird whose confidence gives its victims that much more false security before diving in for a meal. The Adagio practically floats on its own ineffable air, wafted ever higher with each beautifully articulated trill. A compellingly woven Minuetto prepares us for a masterful Rondo as bidirectional runs travel into two succinct and conclusive chords. This disc marks the end of Beethoven’s “early” period (though Schiff is quick to point out the arbitariness of such categorical distinctions). Here we see Beethoven the character actor, the pantomime and experimenter, donning a new mask with each successive gesture. As with every sonata on this standout disc, Schiff displays the utmost patience with the material. The gentle opening is an early morning brightening into daylight: brief snatches of dreams flit across the mind, only to be lost again as we try to grasp them. The Allegro bustles with the liveliness of daily chores, while a funeral march adds a new element into the mix. The second movement pulses with the precise syncopation of Bach’s Well-Tempered Clavier, and is a key moment of transcendence in the collection. As affecting as it is brief, it is suitably balanced in its weight and distribution. This is followed by a plaintive Adagio and the crowning Allegro, between which Schiff exhibits the diversity of his approach as he winds up for a rousing finale. Perhaps nowhere is Beethoven’s posthumously acquired pomposity more sensitively challenged than in this, the ubiquitous “Moonlight”-Sonata (the name is not Beethoven’s, given instead by nineteenth-century German poet and music critic Ludwig Rellstab, who likened the piece to an evening view of Lake Lucerne). There are, perhaps, justifiable reasons why its opening movement has been so widely interpreted, excised from its connective tissue and upheld as a prototypical organ of its kind. Yet none of that seems to matter the moment it falls within Schiff’s purview. The rhythm is duly appropriate, never lagging while allowing for every note to speak its piece. Schiff makes a seemingly bold yet ultimately sensible move in following Beethoven’s controversial cue to depress the sustain pedal for the Adagio’s entire duration. This prescription has more often been overridden because of the modern piano’s longer sustain. Schiff’s magically realized solution seems as much a matter of his choice of instrument as of his technique. The central Allegretto is a vital hinge—“a flower between two chasms” in the words of Franz Liszt—to another recognizable burst of melodic intensity in the Presto, in which the sonata form is resurrected with ferocious efficacy. The “Pastorale”-Sonata, with its instantly recognizable grandeur and intervallic range, marks a period in which Beethoven’s deafness was growing markedly worse. The subtitle was appended by publisher A. Cranz and should be taken with a grain of salt, lest one miss out on the contrasting dynamics of the two central movements. The Scherzo is one of Beethoven’s more charming creations and spices the mix like laughter before hurtling into a kinetic gigue and virtuosic finale. Culled from Beethoven’s so-called “Middle Period,” challenge the heroism so often ascribed to his concurrent works (e.g., the “Eroica” Symphony). Rather, this is an introverted heroism honed in the artifice of its own self-conscious desire. Violence is shown to be futile, as bendable as the will of its practitioners. Schiff characterizes this as Beethoven’s “wittiest” sonata. It also marks a shift from the classical style and indicates a composer desperate to forge his own path. At times parodic, this sonata leaves the listener with a sense of renewed vibrancy and proves that we need not always take ourselves so seriously to create animated art. Despite the dramatic implications of its subtitle (again, not the composer’s own), it is this sonata’s gorgeous Adagio that stands out and partners well with the closing Allegretto’s full sense of development and reprise. The “Tempest”-Sonata is, then, more than just turmoil. It is the sum of its parts, from the subtle and unseen to the antagonistic. This sonata is often noted for its jocularity, but Schiff manages peel back its veneer to expose a deeper psychology at work. Beethoven forgoes the usual ternary form in the Scherzo, thereby shading its sprightly mood with a hint of fortitude. A graver Menuetto and determined Presto bring necessary closure to its titular pastime. The notorious “Waldstein”-Sonata is as economical at its center as it is expansive and epic at its edges. It is beyond programmatic, second in scope perhaps only to the “Hammerklavier.” This is a rollicking and sensory ride through pastures and mountains, rivers and snowdrifts, and all with the concentrated clarity of a composer hermetically devoted to his niche. The central Adagio is an exercise in mounting tension, whereas the final Allegretto sparkles with the effervescence of a natural spring. A particularly formidable section features a floating trill with the right hand as the left jumps quickly through its own set of hoops, all the while sandwiching a series of punctuating notes in the middle register. This precedes a long series of hills and valleys that boils into a bittersweet triumph, undercut as it is by the prospect of separation. The “Waldstein”-Sonata is kaleidoscopic, revealing new perspectives with every turn. The virtuosity here is a wonder, all the more so for Schiff’s ability to shake off romanticism and play with unwavering consistency. In doing so, he allows the variety of the piece to come through with surprising transparency. This was the original second movement of the “Waldstein”-Sonata. After being criticized for its excessive length, it was (after much reflection on Beethoven’s part) switched out for the more succinct movement we have today. This little orphan survived well enough to earn the title of “Favored Andante.” It is almost a sonata in its own right, inverted and miniaturized as if for a shelf of curios. In this sixth installment, continuing with the “middle” sonatas of Beethoven, emotions span the gamut from exuberance to anxiety. Schiff consciously places the formidable “Appassionata” second in this program, bowing to chronology over any a posteriori prestige collected along the way like so much canonic dust. This sonata, which Beethoven placed far higher than his ever popular “Moonlight,” ebbs and flows with a series of thoughtful ruminations and graceful attacks. The result is an accommodating piece, as brilliantly bipolar as it is unassuming—an enjoyable experiment in pastiche that seems to spit out its final thoughts like a conference presenter rushing to stay within time. A clear winner. Schiff’s playing courses like blood and with as much feel for change as one could ask for in a work for solo piano. That being said, one should not mistake Beethoven’s antics for showy musicianship. Accordingly, Schiff loosens the seams only so far before allowing the piece to dictate its own narrative trajectory. Just prior to composing this sonata, Beethoven was confronted with the irreversibility of his hearing loss, and so one might wish to see the “Appassionata” as a cry to hear rather than to be heard. Schiff finds in the octaval opening “an atmosphere of absolute danger.” Beethoven switches moods with the deftness of a seasoned quick-change artist, infused as the Allegro is with dark undertones and rhythms drawn from Scottish folk songs. The middle movement takes a very rudimentary theme and unpacks it for all it is worth. The finale is like a dirge in fast-forward, a tragic life condensed into nine minutes of fleeting youth and unrequited aspiration, and ends with a crunchy spate of frightening detonations. Beethoven was apparently partial to this sonata above all others. Either way, it stands as a vibrant testament to his dedicatory streak. Throughout its two-movement structure, the composer (and Schiff by extension) weaves a picturesque tapestry with essentially limited materials. The opening is filled with plenty of titillating flourishes to satisfy any type of listening while second movement nearly buckles under the weight of its profusion of ornaments, letting up just enough to maintain its integrity. Short and sweet is the op. 79. Its condensations, along with an undying sense of melody interspersed with unsettling mortality, make for (if you will excuse the alliteration) a pointillist portrait of playful proportions. Regardless of what one wishes to make of the exact inspirations behind the programmatic titles of each movement (“The Farewell,” “The Absence,” and “The Return”), this sonata surely tells a story, albeit an elliptical one. The beauty of “Les Adieux” is its openness to interpretation: neither Beethoven nor Schiff want to impose an overarching theory onto the listener. It is a delectable and varied journey throughout which we encounter a variety of characters. In this sense, the sonata “speaks” in both whispers and shouts, relating a tale that never ceases to enthrall. Continuing with its strict chronological adherence, Schiff’s seventh installment of the Beethoven cycle brings us squarely into the composer’s “Late Period.” The Sonatas opp. 90, 101, and 106 represent a turning point in Beethoven’s piano literature, blossoming with a more radical unfolding of internal conflict. Characterized by Beethoven as “a contest between the head and the heart,” the op. 90 is a solitary endeavor into the hinterlands of introspection. Pastoral moments bleed into fleeting lapses of determination that quickly devolve into old habits. Where op. 90 is brooding, op. 101 is nostalgic. This sonata is one of the more romantic in the Beethoven catalog, and opens with assurance in spite of his near-total deafness (descriptive cues, such as “Somewhat lively, and with innermost sensitivity” for the selfsame movement, supersede the standard markings in order to better convey to performers how he imagined the music in his head). The sonata continues with its elegiac exploration of the past and its bearing on the present, culminating in an agitated finale. Considered by many to be the most daunting work of all piano literature, the nearly 45-minute “Hammerklavier” heaves like a gentle beast. Yet the seemingly insurmountable sonata is pulled off here with literary panache. The first movement delights with its palpability and energetic drive. The brusque Scherzo feels all the more so in the company of such towering neighbors, managing to hold its own while injecting much-needed whimsy. Next is the monumental Adagio, in which Schiff gives all the breathing room one could need in order to devour the final movement, building from a tentative Largo to an astounding fugue and coda in which each and every note gallops with equine agility. Schiff is utterly committed to the urtext: he observes every prescription laid out before him. His approach is as constellatory as the music itself, carrying on with or without us. It is not so much timeless as it is timely and deserves at least one undivided listen in sequence, if only to absorb its messages in all their developmental glory. In the Sonata No. 30 E major op. 109 (1820), two compact introductory statements pave the way for an intimate third movement. The music is tear-stricken and brimming with quiet resolution. The somber mood continues with the first movement of the Sonata No. 31 A-flat major op. 110 (1821) before giving way to some merciful humor in the second. The third movement is, for all its sparse distribution, a heavy lament. Though we do get some closure at the end, one senses that recovery is as ephemeral as the notes we have just heard. This sudden spurt of confidence seems a desperate slap in the face of mortality. The Sonata No. 32 c minor op. 111 (1821-22) provides a prismatic conclusion to an already multifaceted collection. In two movements, Beethoven expresses a lifetime’s worth of turbulence while managing to leave with the final proud nod of one who has won a long and fruitful argument. Clearly, the demands presented to Beethoven interpreters are great. Not only must they play under the looming shadow of an enigma, but must also machete their way through centuries of scholarship, public dissemination, and imperialistic reputation. Schiff seems unable to escape the context of each sonata as he approaches it, even as he owns up to his modernity. His renderings have left an indelible mark on the Beethovenian pantheon. He plays as if every finger were its own pianist, offering music that demands attention not because it is Beethoven’s, but because it is ours. For this collection of encores, recorded during his cycle of the complete Beethoven piano sonatas yet never released until now, pianist András Schiff presents selections that, in his own words, “are closely related to the previously heard sonatas.” More than that, however, when taken as their own program, relationships within these pieces are as deep and meaningful as between them. Each is a satellite of the Beethovenian mothership, beaming down messages of darkness and light in kind. The Allegro assai in e-flat minor from Schubert’s from Three Piano Pieces (D 946) introduces the disc with a synchronicity of medium and message that indeed echoes Beethoven in its grammar. With a dramaturgy perhaps only describable as oceanic, it sparkles with lunar pull. The Allegretto in c minor (D 915) that follows unfolds by means of a subtler narrative structure, spiraling in on itself, now with deliberation over desperation. Alongside this door, Schiff opens another marked Mozart in the form of the little Gigue in G major (KV 574). This altogether exquisite piece is an Escherian staircase in sound, and serves as prelude to “Papa” Haydn’s Sonata in g minor (Hob VXI:44). That Beethoven deeply admired Haydn can be no secret after bathing in these spring waters. Schiff’s further distillation is worthy of that admiration as well, and feels as organic as the music is calculated, marrying as it does delicate restraint with robust linearity. Were it not for the applause, Schubert’s Hungarian Melody in b minor (D 817), might be overwhelmed by the aftereffects, but as it stands inhales and exhales a full color palette in this folkish dance. Played, as written, from the heart, its charm is magnified tenfold by this performance. Standing equally alone yet inseverable from the surrounding tissue, Beethoven’s Andante favori in F major (WoO 57), last heard on Volume V of Schiff’s magnum traversal, echoes an even more wholesome quality and shows just how completely Beethoven was able to tell a story. How appropriate that we should end where it all began: with Bach. Between the tastefully wrought balustrade of the Menuet I and II from Partita No. 1 in B-flat major (BWV 825) and the Prelude and Fugue in b-flat minor (BWV 867) fromThe Well-Tempered Clavier, Book I, one can almost taste the dust of Bach’s architectural wonder, which in this context seems like a return to fundamentals. Bones before flesh, and breath before bones. The music of Robert Schumann (1810-1856) has slowly coalesced on ECM’s New Series into a poetic genre all its own. In the capable hands of violinist Thomas Zehetmair, who rendered the labyrinthine depths of the German composer’s string quartets in equal parts crystal and shadow, and here conducting the Orchestre de chambre de Paris in an even more dynamic program, it has taken on new life. For the Violin Concerto of 1853, Zehetmair plays from an Urtext edition to which he himself made important contributions, poring laboriously over the original manuscript to correct the piece’s many errors and elevate it to its deserved status in the pantheon of violin literature. The first movement is almost a concerto in and of itself, moving with the force of an ocean wave crashing on shore. The second movement is emblematic of its composer’s flair for merging strength and delicacy, and of the soloist’s ability to balance the two with artful resonance. As he and the orchestra leap into the final stretch with elasticity, we find ourselves nearly overwhelmed by invention. Few concertos feel as corporeal as this, seeming to pull on every tendon and sinew until it trembles with joy. Although originally thought unplayable by violinist Joseph Joachim (for whom it was written) and Clara Schumann, and never heard until 1937, this recording lends it a resplendent inevitability. Zehetmair’s direction is as vibrant as his playing, and in both one finds an abundance of insight. The Symphony No. 1 (“Spring”), op. 38, of 1841 emerged only after many failed attempts, and in its present iteration abounds with Beethovenian exuberance, but always with that indefinable touch for which Schumann was so highly regarded. The programmatic flair of the first and fourth movements, in combination with the robust exposition between them, articulates a timeless pastoralism in concise terms. It’s an atmosphere rightly shared by the Phantasy for Violin and Orchestra, op. 131, of 1853. It brilliantly concludes the program, funneling every impulse that preceded it into a flourishing ecosystem of ideas. Ironically enough, in this rendering it feels more reflective of reality than the preceding two works, if only by virtue of its fiery exegesis. Zehetmair brings his all to the table, leaving not a single crumb to show for it. The engineering is appropriately raw and clear—so clear, in fact, that a page turn is audible in the right channel in the first movement of the Violin Concerto—and allows us to feel immersed but never assaulted. Violinist Miranda Cuckson and pianist Blair McMillen make their ECM New Series debut in a program of three 20th-century Slavic masterworks. The two-part Sonata No. 2, Sz 76, of Béla Bartók (1881-1945) was composed in 1922, a time when Bartók was deeply into expressionism yet content in mapping two idiosyncratic detours for every step he took in someone else’s shoes. It opens with a profoundly simple statement, intoning the same note on the violin six times across the palimpsest of a piano key strike. Cuckson makes each iteration distinct before swimming against the delicate cascade that ensues. Bartók’s folk influences are by turns clear and obscure, weaving with playful assurance throughout his compositional fabric, and the push and pull between the instruments has never sounded so continuous as in this rendition. The dancing Allegretto gives a range of insights into the composer’s distilling process, which by virtue of its underlying force makes an overlying confidence necessary to carry it across in performance. In that regard, Cuckson’s bow feels like two feet: separate yet guided by the same brain. McMillen’s artful exuberance likewise uproots colorations with systematic abandon. The piece ends as intimately as it began, forgetting every leap as a temporary severance from the gravity of mortality. The Sonata No. 2 “Quasi una sonata” of 1967/68 is a brilliant dip into the font of Alfred Schnittke (1934-1998), whose previous ECM appearances have been equally marvelous. The subtitle here means “like a sonata,” thus betraying the composer’s disdain for the constraint of something so pedantic. Its brazen chords, exaggerated silences, and whimsical details showcase the spaciousness of Markus Heiland’s engineering. Cuckson’s navigations of every angle are wonderous to behold, and McMillen’s presence feels at once responsive and directive. From the airy and mysterious to the grounded and profane, vignettes cohere by the unwavering creativity of both artists. The more insistent and programmatic the music becomes, the less one needs to cloak it in expectations. The default mode of this anti-sonata, then, isn’t pretty entertainment but on-the-ground activism. Ending as it does, violin alone and swooning, it has no qualms over dissolution. From the pen of Witold Lutosławski (1913-1994) comes the Partita for Violin and Piano (1984), finishing the program with something conceptually between its two predecessors. Comprised of three through-composed pillars and garlanded by two ad-libbed sections between, it is a somewhat gloomier yet no-less-playful exposition of plurality. The first movement, marked “Allegro giusto,” is distinguished by its vertigo-inducing glissandi. Such meticulous imbalances work their way through everything that follows, finding only partial traction in the final Presto, as if resolution were the very antithesis of happiness. This leaves us with a wealth of impressions to choose from, any one of which might describe these pieces just as well, yet which falls short of touching fingers around motifs that have no use for category. Whether as composer, oboist, or conductor, Heinz Holliger never ceases to delight and surprise. His commitment to classical music has produced some of the most enduring documents on ECM’s New Series, including one of that imprint’s indisputable masterpieces, the Scardanelli-Zyklus. Here we have yet another turnaround, one that speaks with the open style in which Holliger has become so fluent. Featuring a host of accomplished interpreters—including the now-defunct Hilliard Ensemble—bringing to life a 21st-century cycle of works around the 14th-century French composer Guillaume de Machaut, the Machaut-Transkriptionen (2001-09) represent nearly a decade’s worth of thinking and rethinking through the past in a language of the future. Scored for an unusual combination of four voices and three violas, it weaves direct transcriptions of Machaut into Holliger’s idiosyncratic odes to the same. This is one of those distinctively ECM projects, which, like Ricercar, unravels the avant-garde core of centuries-old music. The compact macramé, for example, that is Machaut’s hallmark is on full display in the program’s introductory Biaute qui toutes autre pere, wherein something more than ink and paper have convened to elicit vital sounds. If the feeling of this balladry is loving and sincere, even more so is Holliger’s enhancement of its rules in his own Ballade IV for three violins. More than ever before, Holliger has built his cathedral out of transparent stone, blacking out the windows, so that the sunlight might be its dominant form of expression. In this sense, Holliger is engaging with Machaut not as the target of an homage, but as the living force of an artist whose music breathes in the winds that shake his boughs. Use of untempered harmonics, transcribed note for note from the original, allows incidental commentary in this regard to seep through. A second diptych, this time around Machaut’s Ballade XXVI: Donnez, Seigneur, transforms the gently sloping path of the original—in which countertenor David James at once renders the skin and the heart keeping it alive—into the wilder detours traced by the present recasting. And while the latter may seem more oblique in its structure, it also shares with its referent a clarity of expression. Both are neural mappings, very much alive in and beyond the confines of a single recorded performance. Even the wordless Hoquetus David of Machaut and Holliger’s responsory Triple Hoquet feel more like pieces of the same puzzle than distant cousins separated by time. Holliger gives us something of a granular synthesis of the former, an embodiment of Celan’s hurricane in the fullest sense. A single voice retains the melody of Machaut’s Lay VII in a standalone arrangement, while guided improvisations flesh out its branches with unpredictable fruit. The Hilliards are best equipped to handle this flower without damaging a single petal. A beautiful piece that challenges not through its dissonances but through its consonances, as does its analogous In(ter)ventio a 3 und Plor- / Prol- / Or- atio for three violins, which from recitative beginnings morphs into a staggered prolation of time signatures, based on the Complainte of Machaut’s Remede de Fortune. That same piece lingers on in the final statement, in which it is combined with an “Epilogue” that unites voices and strings in quadrilateral fashion, distilled until only friction remains. In a universe of countless musical systems, Holliger and his celestial body of work have always charted unprecedented orbits through the space-time continuum. Given the way in which he has refracted himself through Machaut, the sublimity of their intersection is clear, for both have stumbled on the fragility of human contact, tracing its origins just shy of rupture. All pieces were commissioned expressly for The Liaisons Project, Rachel Colbert and Anthony de Mare, Producers. Recorded 2010-2014 at the American Academy of Arts and Letters, New York, and Greenfield Recital Hall, Manhattan School of Music, New York. Listen to that old piano roll play. And what I mean is dance with you. In her exhaustive biography, Stephen Sondheim: A Life, Meryle Secrest shares the story of an adolescent Sondheim’s encounter with the 1945 film Hangover Square, and within it a piano concerto written by scorer Bernard Herrmann. The music’s bold mix of romanticism and Americana captured Sondheim’s imagination and was to become part of the origins of his intersections with the dramatic stage. Sondheim has always composed at the keyboard, charting out his scores in great detail, to be orchestrated by (since 1970) esteemed collaborator Jonathan Tunick. Broadway has relied on this formula, which over the decades the duo funneled into surefire productions, but the project lovingly packaged in this three-disc collection from ECM takes Sondheimania to a new level through the intervention of rigorously trained note-smiths, each occupying a band along a spectrum of collaborations from a distance. The roster of composers, who the behest of new music champion Anthony de Mare wrote new variations on the theme of Sondheim, reveals a depth and variety equaled by the songs they have re-imagined, as William Bolcom, Nico Mulhy, Steve Reich, David Rakowski, Eve Beglarian, Jason Robert Brown, Duncan Sheik, Eric Rockwell, Wynton Marsalis, Derek Bermel, Fred Hersch, Annie Gosfield, Jake Heggie, Kenjie Bunch, Ethan Iverson, Ricardo Lorenz, Paul Moravic, Frederic Rzewski, David Shire, John Musto, Mark-Anthony Turnage, Phil Kline, Bernadette Speach, Daniel Bernard Roumain, Andy Akiho, Ricky Ian Gordon, Nils Vigeland, Rodney Sharman, Gabriel Kahane, Thomas Newman, Jherek Bischoff, Mary Ellen Childs, Peter Golub, Tania Leon, and de Mare himself put a personal spin on the Sondheim songbook that is as true to life as it is to art. Though Sondheim has historically been averse to being interviewed, in this collection we hear him speaking through the hearts of every composer who has felt his influential hand. In an album note, he himself describes these pieces not as “decorations” but “fantasias” of his songs. Indeed, Sondheim’s recognizable voice has been reworked with such fidelity—one original inspiring other originals to create new originals—that one need hardly peel away any layers of obfuscation to find him. Above all, however, it’s his scarcely rivaled gift for pastiche that resonates by virtue of de Mare’s encyclopedic flair. According to Mark Eden Horowitz’s extensive liner text, the composers chose their songs based more on the lyrics and their stories than the melodies sung around them. And so, one can listen assured that de Mare’s consummate touch makes room on his metaphorical suitcase to display every sonic sticker of his travels. His dramatic, romping, emotional rollercoaster ride through A Funny Thing Happened on the Way to the Forum (1962), Anyone Can Whistle (1964), Company (1970), Follies (1971), A Little Night Music (1973), Pacific Overtures (1976), Sweeney Todd (1979), Merrily We Roll Along (1981), Sunday in the Park with George (1984), Into the Woods (1987), Assassins (1991), and Passion (1994) accordingly dwells as much on differences as similarities, bringing to fruition a “global” sound. Not surprisingly, Sondheim’s masterpiece Sweeney Todd gets the most nods of the program, in addition to yielding a lion’s share of its highlights. One of those is Sheik’s “Johanna in Space.” This atmospheric gem opens with the chimes of a clock emulated on the piano and stretches itself over an electronic backdrop à la Tim Story. Todd’s ill-fated daughter is further subject of Brown’s “Birds of Victorian England,” which requires no small amount of heavy lifting from de Mare. As can be expected, Sweeney Todd engenders ample opportunity for over-the-top dynamics, epitomized in the spiraling density and fluent outcries of Bunch’s “The Demon Barber.” Other fine examples of the protagonist’s crushing pessimism abound, whether through the intimate knowledge of Newman’s “Not While I’m Around” or, in a satirical turn, Lorenz’s “The Worst [Empanadas] in London.” The latter requires a performer of de Mare’s chops to pull off the feel for rhythm and energy on which it subsists. De Mare welcomes the listener by shouting, “A customer!” as if in throwback to the speaking-singing pianist genre of which he was such a foundational proponent through his premiere of Rzewski’s De Profundis. It’s only natural, then, that Rzewski should have a piece included: the elegiac “I’m Still Here.” This and other selections from Follies, such as Wynton Marsalis’s Jelly Roll Morton-infused take on “That Old Piano Roll”, imply a bygone age with plenty of style to spare. Company inspires a handful of homages as well, including Rakowski’s impressionistic “The Ladies Who Lunch,” through which Sondheim’s love for Ravel shines (as also in Bermel’s “Sorry/Grateful”); Rockwell’s tangible “You Could Drive a Person Crazy,” in which the composer “imagined a pianist trying desperately to catch the attention of rowdy patrons at a cabaret with as wide ranging a series of pastiches as possible”; and Roumain’s “Another Hundred People,” which invokes the troubled crooning of a Kurt Cobain or Thom Yorke. Sunday in the Park gives us Muhly’s minimal yet expansive “Color and Light,” which embodies the pointillism that so fascinated the play’s subject, Georges Seurat. Muhly’s feel for the piano as a textural toolbox translates superbly. Reich’s more compact “Finishing the Hat” is scored for two pianos (de Mare multi-tracks himself) and links a brief yet persistent chain of chords. Sharman’s “Notes on ‘Beautiful,’” on the other hand, originally a duet between Seurat and his mother, no becomes a conversation between the living composer and his deceased mother. De Mare’s rendition of “Sunday in the Park – Passages (encore)” opens a lifeline to possibilities, and makes us feel connected to our own. Shire’s “Love is in the Air” puts a delightful spin on the original opening number of A Funny Thing Happened on the Way to the Forum, underscoring de Mare’s abilities to evoke the past in a language of the future, while Bolcom’s “A Little Night Fughetta” references Anyone Can Whistle, pushing Bach through a jazzy filter of development. Pacific Overture is another of the less represented but no less effective source texts. Gosfield’s “A Bowler Hat” displays a meticulous feel for deconstruction, while Kline’s “Paraphrase (Someone in a Tree)” paints the first meeting between American and Japanese officials in 1853 with unexpected colors. Merrily We Roll Along gives us León’s “going…gone,” another remarkable highlight that, along with Akiho’s “Into the Woods” is perhaps the most technically demanding of the program. Hersch’s “No One is Alone” is another ode to Into the Woods, this one pentatonic and alliterative. And let me not neglect Beglarian, who pays tribute to Passion in her “Perpetual Happiness.” This striking piece is as real as the music gets on Liaisons, and builds its wings one feather at a time, until flight is achieved. Doing justice to all of the composers and pieces represented here would be a futile, wordy exercise. Suffice it to say there isn’t a single sour note to be found, and as a whole the album demonstrates that, while Sondheim’s music may sometimes play hard to get, it will love you through and through if you let it, because that’s all it wants to do. In September of 2012, Hungarian composer György Kurtág and his wife Márta gave a concert at Cité de la musique in Paris to honor the memory of a dear friend, musicologist Haydée Charbagi (1979-2008). Their program, as adventurous as it was delightful, combined piano transcriptions for two and four hands, exuding such intimacy that it’s a wonder the audience didn’t just melt away from all the love in the hall. For those not present, this DVD bears witness to the Kurtágs’ unbridled passion for each other and the music that passes between them. The program’s bulk is culled from György’s own Játékok (Games), an ever-growing miscellany of dedications to the living and dead alike. It’s also a tribute to classical roots on the whole, as indicated by the composer’s transcriptions of Bach chorales—each a towering trunk among his otherwise microscopic foliage. There’s something dark yet wondrous about the first dissonances that creep from the stage. Saying hello with a farewell, György approaches the score as if it were a poem (such philosophies were, in fact, the subject of Charbagi’s thesis). And perhaps nothing so omnipresent as poetry could express either the compactness or vigor of each brushstroke. As observer, Márta stands like an appreciative statue before joining him at the keyboard. At times, she caresses him on the shoulder after he finishes a solo, an unspoken signal to connect the dots. Those very points of light sparkle in pieces like Flowers we are…, which in conjunction with the pantheonic Baroque selections enables a poignant contradiction: namely, that Bach’s music eminently looks forward while György looks backward, leaving us in the middle like the binding of an open book. His own responsory is as much a reflection of the one to whom it is dedicated (Joannis Pilinszky) as the composer who vaulted the form. With most at or under a minute, these concert selections are rife with inflection. 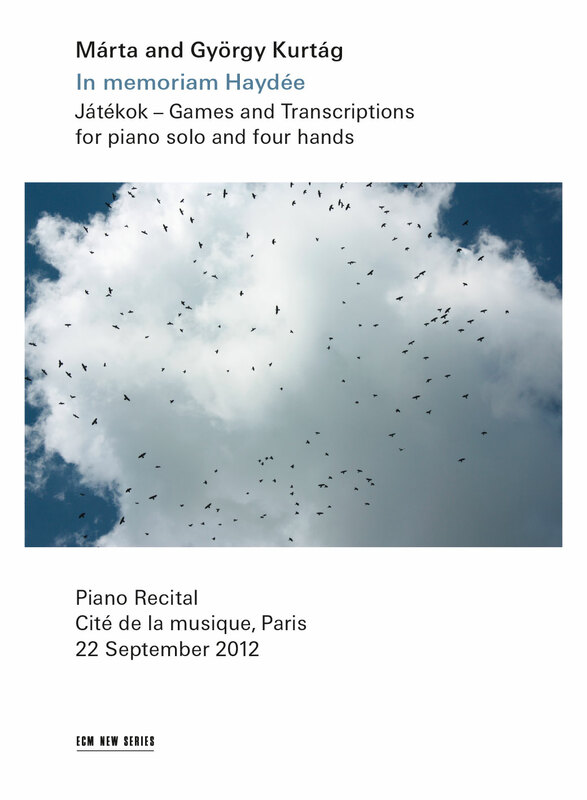 There are moments of staggering beauty, especially in the Hommages, such as the Hommage à Christian Wolff, with its tip-toed notecraft, the resonant Hommage à Stravinsky – Bells, and the Hommage à Farkas Ferenc in its multiple incarnations, each more nuanced than the last and ideally suited to the composer’s greatest interpreter, Márta. Campanule, as with so much of what transpires, expresses the pregnancy of emptiness, and the potential for healing amid broken motifs. This would seem to be the underlying message also of playful asides such as the fierce exchange of single notes that is Beatings – Quarelling and the kindred Furious Chorale. Another elliptical piece, Study to Pilinszky’s “Hölderlin,” gives musical interpretation of a poem written for Mr. Kurtág and reinforces the concert’s overarching theme, while the dramatic (Palmstroke) and the programmatic (Stubbunny and Tumble-bunny) trip over one another in search of continuity. Director Isabelle Soulard focuses on these passages in close-cropped framings, allowing the tender lattice of Aus der Ferne, written for the 80th birthday of Alfred Schlee, and the confectionary first movement of Bach’s E-flat major Trio Sonata (BWV 525) to shine all the brighter among this crowd of lamentations. For if anything, György’s art is about remembrance—a point driven home by the three encores, all of which reiterate pieces featured in the main program: the Hommage à Stravinsky and two of the Bach arrangements. Were it not for programs and obsessive musical minds, we might not even notice the repetition, as life consists of nothing but.